I bet half of you are scared to read my blog after reading that title, but I promise it’s PG and not gross. I’m in Louisville for the next five days scoring Advanced Placement Language exams (and, no, you can’t rob my house because I left my dog and dog sitter in it — just in case you wanted to try). I’m staying in the Galt House, which is a hotel that I would recommend to anyone staying in Louisville. I’m not exaggerating when I say that the suite I’m staying in is more spacious than my entire apartment in grad school. However, I’ve noticed a few oddities in the bathroom accommodations here. 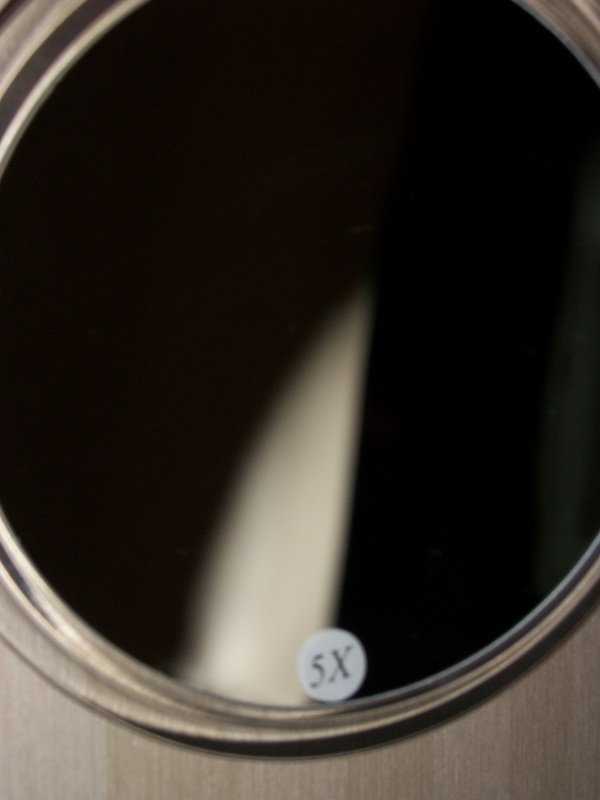 The Galt House, being a fine establishment, actually has a magnifying mirror hanging on the wall. It just won’t do for guests to get hairy caterpillar eyebrows while enjoying their stay. But, take a look at the horrible picture of the mirror. Why did they leave the 5X sticker on there? I guess it’s for protection. Early in the morning, guests should know that all their facial flaws are about to be magnified 5 times over. Maybe it’s the southern hospitality. But the story usually plays out in two ways. Sometimes there is exactly one hook in the bathroom where all the people staying in the room can hang their towels. And, I don’t play that game. A bath towel is a private thing in my opinion. I don’t want another person drying her hands on my bath towel or hanging the bath towel that just dried her body over the towel that I’ll use again to dry my body. No. Yuck. Too close. 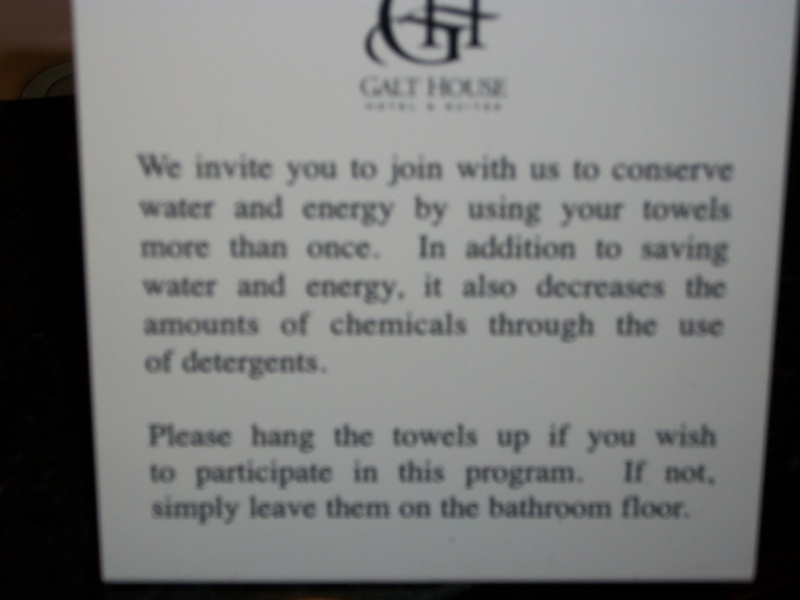 But, the Galt House, being a luxury establishment, has somewhat enough hooks in the bathroom, so my roommate and I, being the environmentally responsible people that we are, hung our towels up this morning. The second story line played out. The housekeeper didn’t leave the towels there. I don’t think I’ve ever seen a hotel housekeeper at any establishment leave the towels hanging where they are. Fresh towels are always waiting when I get back to the room. I’m an English teacher, and I know how attentive people are to instructional signs, so my guess is that the housekeepers give up trying to leave the towels hanging after too many people call the front desk yelling about not having fresh towels because they haven’t read the sign that is right by the sink (note that these inconsiderate people probably didn’t wash their hands either because they didn’t read the sign). However, if hanging the towels up does nothing, that does beg the question, Why leave the sign? I wonder if I hang my towel up tomorrow and cleverly perch the sign on it if the housekeeper will leave it.